Our range of products include stainless steel mesh gloves and niroflex metal mesh gloves made in germany. Niroflex - easyfit chainmail / metal mash gloves A glove with multifunctional talents. The name says it all. Because fast and easy the easyfit range will lead to perfect fit and maximum safety. Niroflex 2000® 100% stainless steel cut-resistant glove is designed without fabric straps that could harbor bacteria. The design is on the USDA Meat and Poultry Equipment Review Program's accepted equipment list—great to help protect wearers and safeguard against contamination in food processing applications. It's good for knife sharpening, too. The woven, interlocked metal mesh is strong and secure, with max. gap of only 3mm to help fend off knifepoints. Proprietary clip closure adjusts easily and simplifies cleaning. A bar-coded tag helps track gloves issued to employees or to chart your cleaning schedule, and it is color-coded by size for quick selection. Note: Sold as individual gloves. 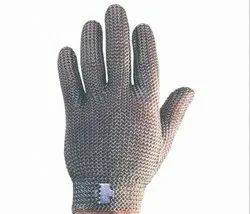 Looking for “Stainless Steel Mesh Gloves”?